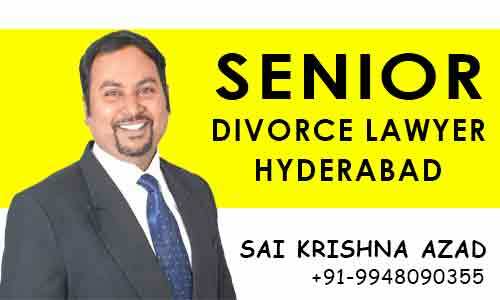 Sai Krishna Azad is one amongst the Best Divorce Lawyers in Hyderabad, Telangana. He is having an experience of 15+ years with 100% success rate with all divorce cases he has handled. Divorce the word itself is painful for many. When you wish to proceed with a legal formality to relieve from your marriage, the hesitation, the doubts, fears, chaos in mind and heart needs an expert divorce lawyer to handle along with the legal proceedings. We also provide consultation services to clear all your doubts and fears before you take the leap of faith in your life with us. We provide the best services as a legal entity to come out of your marriage within a reasonable time frame and with the best legal and mental support, anyone can give you. All our client information is maintained highly confidential. We understand your needs and provide the legal services which suit your needs. Any other services as related. We undertake all sorts of cases like Mutual divorce, NRI divorce, Legal custody of the child, Contested divorce proceedings and etc. Why to choose us? below are the reasons. We provide the best in-person legal advice answering all your queries. We have specialized and vast experience in dealing with divorce cases. Our relieved clients gave us the best testimonials. However simple or complicated your divorce case we can handle it for you and relieve you from your mental agony. Parties to the divorce should be living separately since last one year on the date of filing of the petition for divorce. Documentary proof of marriage between the parties is to be filed before the court. The proof of residence of the parties is also to be filed. The petition is to be filed in the concerned family court where the parties resided/resided or the matrimonial home is situated. 1. After my filing for divorce, the guy left to another city and is not ready to come back for the hearing. What can be done? a) You can get the divorce under sec 13(1) (i-a) under the ground of cruelty. 3. Is NRI divorce valid in India? a) NRI divorce is not valid in India, but you file a declaration suit. 4. How to file a divorce in India from abroad? a) You can file through GPA (General Power of Attorney) or SPA (Special Power of Attorney). 5. How Long Does It Take For A Divorce Case In India Normally? 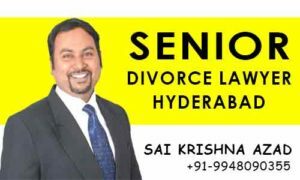 Hope we[divorce lawyers in Hyderabad, Telangana] solved your family legal issue.